Any government proclaiming it is going to spend £950m in the South West on new roads and other transport schemes might expect a mixed reaction from motorists and environmentalists. Thursday's announcement means more of a mix of winners and losers. The news that approval has been given to the A354 Weymouth Relief Road in Dorset comes as welcome relief, both to drivers fed up with queues of traffic to and from the resort, and to the local organisers of Olympic sporting events in 2012. Environmental campaigners are bound to object and a public inquiry is highly likely. However, the Olympic card will be influential if it eventually comes to a ministerial decision. In Somerset, Taunton motorists will be celebrating the new £28m scheme to provide an alternative east-west connection across the town, plus a new bridge over the River Tone. Anyone who has been caught unwittingly in trying to drive across town at the wrong time knows you can grow old very quickly in a traffic jam in Taunton. But in Cornwall the tables have been turned. For the first time the government asked the South West Regional Assembly and the Regional Development Agency (RDA) for advice on where to spend the millions. 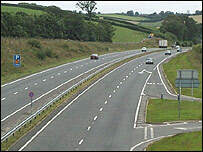 The RDA recognises it has disappointed many in Cornwall by throwing out plans to dual the last stretch of A30 single carriageway across Bodmin Moor, from Temple to Higher Carblake, plus another from Carland Cross to Chiverton Cross. The bottlenecks remain. Not only that, but the government has also agreed to dump the A39 Camelford Link Road and the A391 link from St Austell to the A30. There is widespread dismay at Cornwall County Council that years of effort and thousands of pounds spent preparing plans have been put on the back burner, not to be revived until the next change of government at the earliest. Environmentalists, of course, will probably be happier. In Dobwalls, however, there is confirmation for the bypass on the A38, which now awaits the outcome of a recent public inquiry. The scheme is in the frame for funding in the next three years and if the inspector says yes, it could be the first of the South West schemes to be have the ribbon cut. In south Devon, a muted "hurrah" has been heard now the Kingskerswell bypass is back on the list. According to the RDA, this is a positive move. However, plans are not well advanced, let alone approved. Schemes of various sorts have been promoted for more than 50 years. The most recent is a suggestion by local MEP Graham Booth that it should be a tunnel, not a by-pass. Maybe it is not surprising it may take 10 years; and everyone knows that, with this scheme, we have been here before, as governments have advanced the plans towards the top of the priority list and then pulled the ladder away. It is one for the environmentalists to smile about. Motorists, do not hold your breath.